Croatia holds a special place in the world of wine. From Slavonian plains to farthest Dalmatian islands, as many as 130 native wine grapes grow in Croatia. Despite being a small country, Croatia is specific for its geographical and climate diversity which contributed to specific wine sorts found only in Croatia. It's no wonder that recently Croatian wines are slowly getting a reputation similar to more famous French, Californian, Chilean or German wines. In 2016, Croatia won as many as 63 Decanter World Wine Awards medals. The same year it was voted by readers of USA TODAY and 10Best.com as one of the 10 best wine regions in the world. Also, in 1996 it was discovered that the famous Californian wine Zinfandel shares its genes with Croatian grape sorts Crljenak Kaštjelanski and Tribidago. Not even Anthony Bourdain, the world famous chef, couldn't resist the magic of Croatian wines. On his visit to the Bibich winery in Skradin he exclaimed: "Why is there so much great wine in your country?" The potential of wines is getting more and more recognized in tourism. Wine and walk – walking through vineyards while drinking wines and tasting local cuisine- have proven to be very popular, especially the ones in Istria, continental Croatia or on Pelješac peninsula. The most common made wines in Croatia are red and white ones. The majority of wine production is white wines (67%), while red wines make up 32% of wine production. White wines of a gentle taste are dominant in the continental part, while red wines are dominant in Coastal Croatia. Lots of wineries in different parts of Croatia make their own wines, different from other similar ones in ways of production (eg. The Momjan based winery Kozlović makes Istrian malvasia, while the Plenković winery on Hvar makes Zlatni plavac). This golden colored white wine is named after the grape sort it is made of and it's native to island Korčula (Čara and Smokvica). But, except on Korčula, pošip is made in other parts of Central and Southern Dalmatia. Pošip is the first Croatian white wine with a denomination of origin. This wine is high in alchohol (around 13 to 14%) with a dried fig and apricot note. We reccommend drinking it with fish, shells and white meat. Choose one of the apartments from our offer on Korčula. While you're there, visit some of Korčula's wineries (Pošip Čara or Smokvica) and try out this refreshing white wine. This white wine is made from the autochtone grape sort vugava that is exclusively grown on the farthest centraldalmatian island Vis. Vugava is specific for its fresh fruity and creamy notes and it has around 12% of alchohol. Vugava was famous even in antiquity. It's said that the Greek historian Agatarhid was thinking of this wine when he wrote that the wine of Issa island is better than other wines. Vugava is a perfect refreshment from summer heats served along with white fish, other sea dishes and lamb under a baking bell (peka). Babić red wine is made of the native grape sort Babić, named after the family that makes this wine. Its characteristics are a dense structure with blackberry and fig notes. This sort, especially when being used in making premium wine, is best grown on a karstic terrain above the little town of Primošten, near Šibenik called the Primošten terraces. Drink this aromatic red wine with pršut, pašticada, hard cheese and red meat. 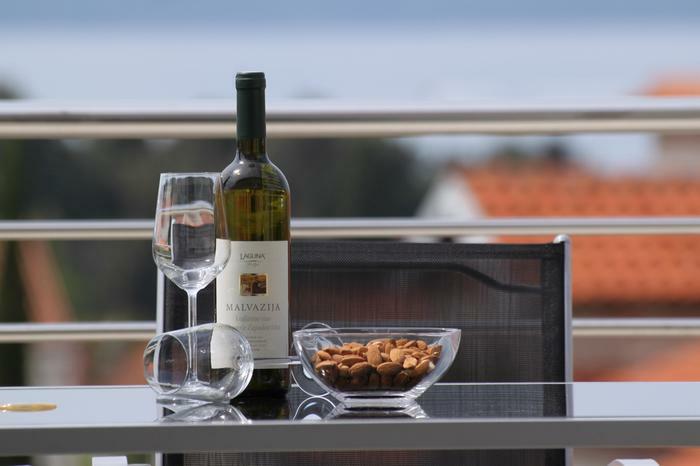 Book an accommodation in Primošten and make the most out of your vacation by visiting some of the wineries where you can have a taste of this popular red wine. Graševina is one of the most popular vines in Croatia. Made from the same named grape sort traditionally grown in the continental parts, but most common in Slavonia. It's a dry white wine of yellowish green and a fresh fruity and flowery note. Although the sort itself is not native to Croatia, its taste and characteristics are so specific and different from other wines of the same sort. That's the reason why Croatia is sometimes known as the country of graševina. This wine is served cool (from 8 to 10°C). Drink it along with pasta dishes, white meat and fish. Dingač is Croatia's most famous wine, also known as "the king of all Croatian wines". Premium wine of the Plavac mali grape sort is named after the karst region of Pelješac – Dingač. In 1961, in Geneva, Dingač was the first ever Croatian wine awarded a denomination of origin. This red wine is very high in alchohol – around 15%. It's color ranges from dark red to purple red with a sour taste and a fruity note. We reccommend to drink Dingač with red meat, goulash and hard cheeses. If you're still not sure where to stay on Pelješac, take a look at our offer of apartments and rooms. Island Krk is also proud of a native wine. It's Vrbnička Žlahtina, a quality dry white wine made of a native grape sort – white žlahtina. This rare sort is grown exclusively in the Vrbnik field of the Krk winehill. Žlahtina is a gentle and refreshing wine with a fruity and flowery note. Drink it with goat cheese, pasta and white meat dishes. The first sea champagne in the world – the Valomet – is made of žlahtina. Its way of maturation is really unusual. The casks are put on the bottom of the sea and are kept there for several months. When taken out, layers of corals and shells are left on the bottles. The Valomet is then sold in this interesting design. Lasina wine is produced in Plastovo near Skradin. It's made of the lasina grape. This wine is different from other Dalmatian red wines for it's gentle taste. Lasina grape is commonly used for mixing with other grape sorts. It's also used for making the dessert wine prošek (not to be confused with the Italian wine prossecco). Drink it cooled with every kind of dish.